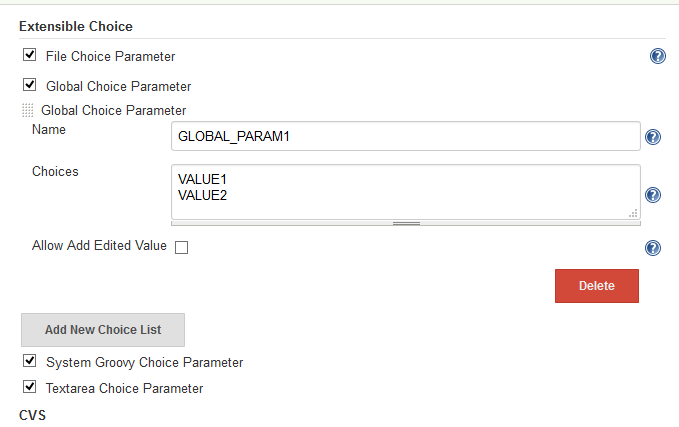 Inheriting ChoiceListProviderDescriptor allows you display a global configuration only when it is enabled (See Global Textarea Choice Provider in the screenshot above). …eParameterDefinition to disable specific providers. …rs in system configuration page. …ector, which is provided by Jenkins core. This avoids problem with Jenkins-1.610. / Now handles also $class not only stapler-class. …n is enabled only when inheriting ChoiceListProviderDescriptor. Gets to use dropdownDesciptorSelector to resolve JENKINS-28046. And descritor.enabledChoiceListProviderList hides disabled providers. Includes changes for JENKINS-28046 and JENKINS-25403 as changes for config.jelly will be conflicted if splitting them into different pull requests. Above tests are moved from ExtensibleChoiceParameterDefinitionSimpleTest. Above tests are moved to Above tests are moved fromExtensibleChoiceParameterDefinitionJenkinsTestas those tests get to require Jenkins instance andExtensibleChoiceParameterDefinitionSimpleTest` doesn't set up Jenkins instance to save test execution time.